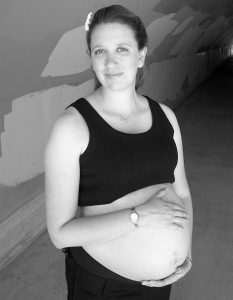 I began my pregnancy with an OB but switched to April’s care at 31 weeks after meeting her in person and falling in love with the midwifery model of care and April herself. I knew in minutes she was the person I wanted to attend my birth. A few days before my Tyler was born I experienced intermittent surges for several days in row. I knew my body was preparing for the big day but the anticipation was enough to make a person crazy. Finally, on a Friday night my husband Mike and I went shopping for a rocking chair and had dinner. During our meal I felt an overwhelming change come over my body and I knew it was time to return home and settle in for the night which would bring us our son. Upon returning home I got into the bathtub as my surges began to grow closer together and stronger. Mike called our doula Arla and she came to our home with no delay. I labored around the house for several hours, on the toilet, leaning on the birth ball, on all fours and in our bed. I felt a change and decided it was time to head to the hospital. Upon arriving I was disappointed to find out I was still only 3cm and was given an option to either walk around or return home. After an hour in the L&D triage, I was really ready to go back home to my own bed. Upon returning home I slipped into bed with Mike while Arla rested in the guest room down the hall. At around 5:30am on November 18 I felt a pop and knew instantly that my water had released. I rushed into the bathroom and managed at least one surge on toilet. I walked back into the bedroom where Mike and Arla were waiting. I curled up on the floor in a pregnancy modified child’s pose and moved through a couple more surges before I asked for help into the shower. My birth team helped me and turned the water up nice and warm. I remember watching through the bathroom windows as the sky began to change colors from a deep blue to an early morning gray and noticing there wasn’t a cloud in sight. I still compare every early morning sky to that one. I moved constantly, following my bodies cues to change position as each surge came over my body and my baby Tyler moved closer to the outside world. With two strong and intense surges my cervix seemed to open completely and I began to feel the pressure of my son’s head. Arla asked me to check myself to see where his head was which I did and motioned to my second knuckle. I continued moving with each surge, not saying a word but knowing Arla was just outside the shower door, watching me and supporting me in the most intense part of my labor. Mike meanwhile rested as best he could in the bedroom. After another short while I checked myself again, feeling so exhiliarated from the first time at feeling Tyler’s head and hair moving closer. This time I motioned to the first knuckle. Arla jumped up and began doing her best to convince to get out of the shower, which I had little inclination to do. I began telling myself that Mike, who is a firefighter and EMT could deliver his son; that was his job, right? The laboring woman’s brain works so differently and what finally convinced me to leave was her comment “you can’t have this baby on the floor of this shower!” In my head I responded, “you’re right, I didn’t ever get around to cleaning the shower this week, and besides we have no cord clamps!” It had only been 90 minutes since my water released. I was finally convinced to leave my comfortable shower and dry off. After a brief and insincere “I hate you” to Arla for making me leave I moved to the bedroom slowly. Putting on my clothes to get in the car I remember Mike and Arla putting warm socks on my feet and thinking “I can tell Arla has children because she knows how to put socks on someone’s else feet. Mike will learn how to do it too soon.” It’s amazing how the mind wanders during such an intense physical and emotional time. We moved towards the car, pausing on our way for the strong surges that were pushing Tyler out of my womb. We drove quickly in the brilliant morning sunlight. I sat tilted in the seat as it was too much to sit squarely, I had a baby’s head nearly coming out of me! We reached the hospital and I walked into the L&D unit pausing for two surges along the way that made my whole body shake and my knees give way. Thank goodness Arla and Mike were there to hold me up. The L&D staff apparently weren’t convinced I was about to have a baby because they seemed preoccupied with finding a wheelchair to convey me to a room. I remember clearly leaning on a chair next to scale in the hallway thinking if they didn’t get me somewhere soon there was going to be a baby born in that hallway. When we were finally taken to a room and I got on the bed Arla noticed Tyler was already crowning. April wasn’t even there yet, though she did arrive just a minute or two later. These facts sent the nurses in the room into a tizzy and I recall seeing them run around the room calling for this and that. When April arrived it didn’t even register. I was so consumed with my labor I hardly noticed her standing calmly and patiently at the end of the bed. Tyler was born 8 minutes after we arrived at the hospital and his father’s hands gently guided him into the world. He was placed on my belly, his little hand covering his face, trying to shield his tiny eyes from the glare of bright hospital lights. He was warm and wet and perfect. I remember crying out as his head passed completely from me, but it wasn’t a cry of pain. It was a cry of triumph and joy. The pride of bearing this child into the world on my own overcame my otherwise quiet labor.